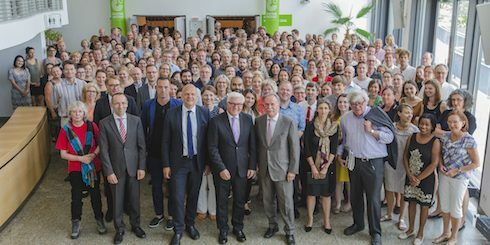 Today, Foreign Minister Frank-Walter Steinmeier visited the head office of the Goethe-Institut in Munich for the first time, where he was informed about the latest projects by Germany’s largest mediating organization for foreign cultural and educational policy. In a discussion in front of more than three hundred staff members, he spoke about what politics and culture can accomplish. Johannes Ebert shows Frank-Walter Steinmeier and his wife information about the Goethe-Institut’s activities for refugees | Photo: Loredana La Rocca / Goethe-Institut During a tour of various parts of the building, Frank-Walter Steinmeier was given insights into projects for refugees, international educational programmes and the worldwide social media activities of the institute. 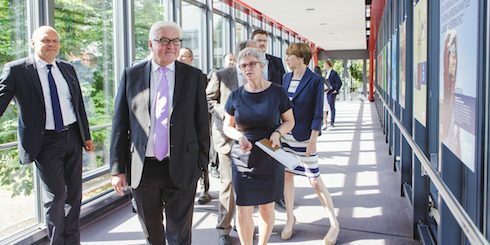 Tour of the head office of the Goethe-Institut – here, the exhibition “Germany, Land of Inventors” | Photo: Loredana La Rocca / Goethe-Institut What can politics und culture accomplish? Foreign minister Steinmeier, secretary-general Johannes Ebert, the architect Regine Keller (TU Munich) and the two writers Albert Ostermaier and Tilman Spengler held a discussion about what politics and culture can accomplish in the present situation and about what its responsibilities are. Three hundred staff members observed the discussion at the head office while 65 institutes around the world streamed it live. On the panel (left to right): Albert Ostermaier, Johannes Ebert, Frank-Walter Steinmeier, Klaus-Dieter Lehmann, Regine Keller and Tilman Spengler | Photo: Loredana La Rocca / Goethe-Institut “Nothing works without culture,” Steinmeier summed up. From different points of view, the participants discussed how the integration of refugees and solidarity within Europe can be achieved and how civil society can be strengthened in view of censorship and interventions in the public space. Apart from Europe, the conversation focussed in particular on the developments in China and Africa and their repercussions in Europe. “Culture can be a beachhead and can absorb and express fears unsparingly and uncompromisingly. Artists do not stand at the fringes, but are part of their society,” said Albert Ostermaier of the writer’s forum “front:text” that he curates at the Literaturfest Munich.